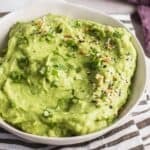 This Guacamole recipe is tasty, Keto, Paleo-friendly, Dairy-free, and Gluten-free. Remove the skins and pits from the avocados and place them in a food processor or blender and blend until smooth. Add in the remaining ingredients and pulse until combined for chunky guacamole. For smooth guacamole, continue blending. Once done, remove, place in a bowl and garnish with more cilantro and olive oil. Then serve and enjoy. If you prefer not to make this Guacamole using a blender, you can simply mash the avocados up using a fork for a more chunkier Guacamole. Then, add the other recipes to the mashed avocados. Mix and serve.